Jon Heath : Win a 'Mile High Madness' Tee From True Rivalry! Win a 'Mile High Madness' Tee From True Rivalry! Update (4/5): Congrats to Garland Sanburg for winning the tee! The 2013 NFL Draft is quickly approaching, but besides the routine pre-draft buzz, there is not much to talk about these days. That is why we have teamed up with True Rivalry to bring some excitement to the site leading up to the draft. 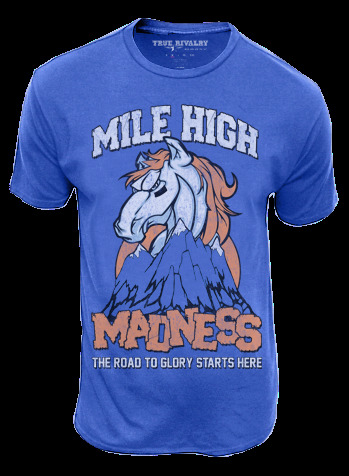 We are giving away a "Mile High Madness" tee, provided by our friends at TR, to one lucky Denver Broncos fan this week. To enter the contest, go check out TrueRivalry.com, 'Like' JHSM on Facebook, and then comment below. The commenter that receives the most +1's between now and Friday morning (April 5) will win the tee! This is not a late April Fools joke. Promise. The folks at TR are giving away the tee just because they are that cool. Rules: Only comment once, and please do not enter the contest if you are not living in the continental United States. Note that any inappropriate comments will be removed. Note: Some Internet Explorer users have experienced trouble commenting through Disqus on the blog. If you are using IE and are unable to comment, please try using either Google Chrome or Mozilla Firefox. Want the tee NOW? Use promo code "JHSM" (without the quotation marks) on TrueRivalry.com to receive a 15% discount!